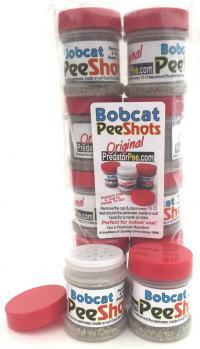 The Predator Urine concept is based upon the principal of duplicating the use of urine by animals in the wild. Predators mark the perimeter of their territory with urine helping prey like deer and other animals tell whether an area is safe or dangerous. Learn how to use PredatorPee natural animal repellent products to effectively keep pest animals away. When using our Scent Tags, place every 10-12 ft using the included twist ties and ground stakes. Saturate with “pee” to create a long-lasting “pee-rimeter.” Reapply this natural outdoor animal repellent every 7-10 days or immediately after rain. It is recommended that Scent Tags be placed out of reach of sprinklers or irrigation systems. Each Scent Tag will absorb about 1/2 oz of Pee, so you should get about 2 applications of 10 ScentTags (100-120 lineal feet) per 12oz bottle. 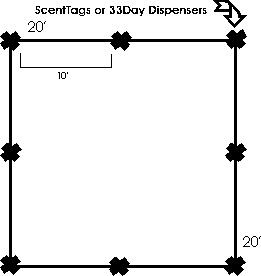 When using our weather proof 33 Day Dispensers, place every 10-12 ft using the included twist ties and ground stakes. Fill with about an ounce of “pee” to create a long-lasting “pee-rimeter” that is protected from the elements. Refresh with urine once a month. Each dispenser hold about an ounce of Pee, so a 12oz bottle should be sufficient to fill 10 dispensers and protect 100 - 120 lineal foot perimeter for about a month. We do not recommend squirting the urine directly on plants or other living vegetation. 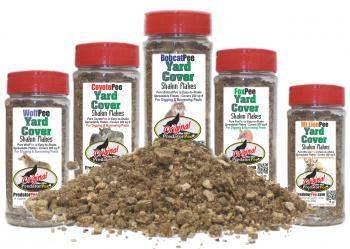 PredatorPee Yard Cover Shakin' Flake Granules ares designed to make it easy to spread our natural Wolf urine, Coyote urine, Fox urine, Mountain Lion urine and Bobcat urine outdoor animal repellent or pet training scent on lawns and other large areas where creating a perimeter would be difficult or impractical. One 16 oz. Jar of Yard Cover will treat approximately 200 sq. ft. Reapply every 7-10 days or immediately after rain. Excellent for burrowing pests like ground squirrels, groundhogs, moles or voles and lawn-wrecking critters like skunks and armadillos. New PeeShots for Indoor Use and Vehicles too! 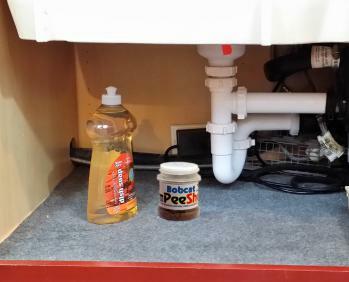 Just remove the tops and place along the foundation in basements, under sinks and other dark corners, under eaves in attics - smell dissipates quickly. 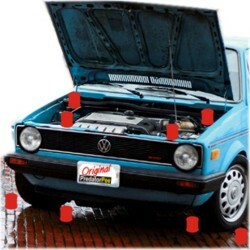 Also Perfect for Boats, Rv's and Cars to protect upholstery and wiring.